"May the Lord give you His peace!" I must begin with an apology. It has been a long time since I have shared a message on this website of the Cenacles of Life! Unfortunately, I got so busy with other things that I lost touch with this marvelous movement of prayer for peace and protection of life, especially of the unborn. We need Our Lady's help and powerful intercession, now more than ever in the light of the terrible threats to our religious freedom as well as the continued destruction of human life at all its stages, beginning with the unborn child by abortion. I am grateful that Mary Weyrich has kept the website going. She told me recently that there are Cenacles of Life in 40% of the archdioceses/dioceses of the USA. Our goal is 100%! 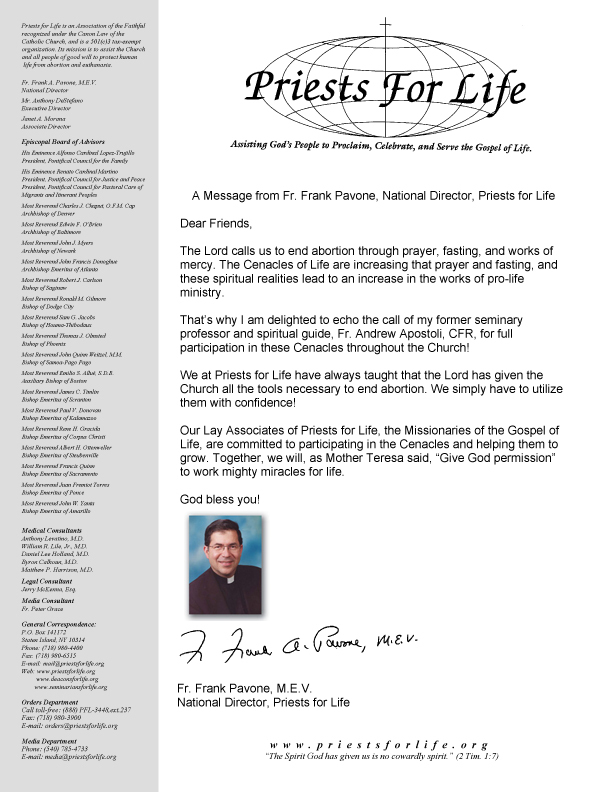 Please help us by remaining faithful to your Cenacle of Life. I am sure that you are well aware of the great spiritual struggle going on in our nation today, namely, that a presidential "mandate" is trying to oblige Catholics and other religious believers to go against their consciences and pay for contraceptives and abortifacients (that is what the so-called "morning after pill" really is) despite their religious beliefs and convictions that these are morally wrong and offend God Who commands us to respect human life from conception to natural death. (I do not believe this order can be called a "mandate" which is a command given by someone who has authority to give such a command. Only God has authority to command a person's conscience. If any human being were to try to command another person's conscience, they would have a very distorted self-image since they would be claiming an authority only God has. Rather, I think it should more accurately be called a "dictate" such as dictators give who assume the power to issue any orders they want, regardless of peoples'sacredness of conscience!) We are reaching a point comparable to the early Christians who were told to offer sacrifices to the pagan gods or be martyred. Today our "martyrdom" will be different: we will be fined, possibly imprisoned, our properties confiscated, our freedom of religious worship restricted, etc. Our secularism today is, in my opinion, simply the American form of Communism. After all, what were some of the main elements of Communism? Attack the sacredness of human life because it is a God-given dignity; destroy the Judaeo-Christian concept of the family as the marriage of one man and one woman to conceive, nourish and protect human life; restrictions on all religious rights (Joseph Stalin said that the Catholic Church was the worst enemy that Communism had and still has, and he tried to destroy it). But we are not helpless before this evil threat. It is basically a spiritual battle, and we must use the spiritual weapons God has given us to do good and overcome evil. (Of course, we must also do our part politically by choosing as elected officials those who defend life and the freedom of conscience.) I find great hope in the message of Our Lady of Fatima. She foretold in her apparition of July 13, 1917, that a great evil would begin in Russia (=Communism) and spread its errors around the world, provoking wars (Korea, Vietnam), famines (Stalin starved millions in the Ukraine), persecutions of the Church (which we see now in our present situation) , and that the Holy Father would suffer much. As Pope John Paul II said: at Fatima, Our Lady summed up the entire 20th century! What must we do? First, please continue to be faithful to your Cenacle of Life! As Pope John Paul II said, "A great prayer for life is urgently needed." Second, live a good Christian life, and encourage others to do the same. Third, pray the Rosary each day as Our Lady requested at Fatima. She told Lucia, Francisco and Jacinta that the Rosary was powerful enough to stop wars, bring world peace and convert sinners! We need these blessings desperately at this time! Fourth, offer little sacrifices and bear your daily sufferings in union with Jesus and Mary! This adds great power to our prayers. Finally, do the practice of the Five First Saturdays in reparation for offenses against the Sorrowful and Immaculate Heart of Mary! Our Lady insisted that this was absolutely necessary for the conversion of Russia and the world. Despite its importance, Sr. Lucia said that, unfortunately, it was the most neglected part of the message of Fatima. My brothers and sisters, allow me to conclude this important message with a recommendation of my recent book on Fatima entitled: "Fatima for Today: the Urgent Marian Message of Hope".. It is available through Ignatius Press which asked me to write it for them. They asked me to "put everything in it" and that is what I tried to do. It contains the history of all the events, answers to objections, an explanation of the spiritual importance of this message and how to carry it out faithfully. If you read it, I am confident you will find it both encouraging and enlightening. One of the most frequent comments people have made to me after reading the book was: I learned so much about the Fatima message that I never knew before! As Our Holy Father, Pope Benedict XVI has said: "Learn the message of Fatima! Live the message of Fatima! Spread the message of Fatima!" This is Heaven's answer to earth's problems! Let us pray for one another! And do not be afraid! See the Progress of the Cenacles of Life Movement!